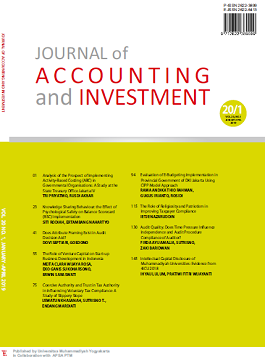 Journal of Accounting and Investment or JAI (previously known as Jurnal Akuntansi dan Investasi from January 2000 to June 2018) is peer reviewed journal published by Universitas Muhammadiyah Yogyakarta in collaboration with the Association of Accounting Department of Muhammadiyah Higher Education (APSA PTM). ISSN: 2622-3899 (print) and 2622-6413 (online). JAI is accredited grade 2 by Ministry of Research, Technology and Higher Education of Republic of Indonesia, Decree (SK) No. 21/E/KPT/2018 valid from vol 17 no 1 (2016) until vol 21 no 2 2020. Since the first issue in January 2000, JAI keeps publishing scientific articles consistently, both research and literature review articles. JAI publishes the new editions every January, May, and September. By January 2016, JAI had published both printed (book) and electronic (PDF) version. Electronic articles are accessible openly on the web page: http://journal.umy.ac.id/index.php/ai and printed versions are available for sale (click here to order). CAUTION: Before you submit a manuscript, make sure that your paper is prepared using JAI TEMPLATE FOR SUBMISSION, has been proofread and polished carefully, and conformed to the JAI AUTHOR GUIDELINES. ATTENTION: Visit also our colleague Riset Akuntansi dan Keuangan Indonesia (Accredited SINTA Grade 2) and Jurnal Reviu Akuntansi dan Keuangan (Accredited SINTA Grade 2). Komunikator ISSN 2549-9246 (online) and ISSN 1979-6765 (Printed) is published twice a year in May and November. Contains writing that is lifted from the results of research and conceptual thinking in the field of communication. Publishers receive written contributions that have never been published in other media. Posts can be directly inputted into the system of Komunikator e-journal on this page by way of registration first. Incoming scripts will be edited for uniformity of formats, terms and other ordinances. The Komunikator is published by Universitas Muhammadiyah Yogyakarta. Since April 2019 Komunikator was accredited at rank SINTA 3 by the Ministry of Research, Technology and Higher Education of Indonesia according to the Decree (SK) No. 10/E/KPT/2019 and valid until April 2024. Jurnal Afkaruna is an Indonesian bilingual journal published by the Faculty of Islamic Studies, Muhammadiyah University of Yogyakarta. The journal publishes empirically grounded and multidisciplinary work on Islam and its related issues, spanning the history, Quranic studies, Exegesis, tradition, education, dakwah, politics, sufism, philosophy, Islamic manuscripts, Islamic economics and finance, social movements, ritual and philanthropy. Afkaruna aims to promote excellent scholarship or articles on Islam that present original findings, new ideas or concepts that result from contemporary research projects in Islamic studies, area studies (especially Southeast Asia and the Middle East), social sciences, and the humanities. Intended for a regional and global readership, Jurnal Afkaruna is published two times a year (June and December). As a peer-reviewed Indonesian journal, it welcomes scholarly works on Islam written in English and Bahasa Indonesia. ACCREDITED BY THE MINISTRY OF RESEARCH AND HIGHER EDUCATION: SK DirJen PRP Kemenristekdikti No. 1/E/KPT/2015 21-Sep-2015, 2015. Afkaruna (AIIJIS) is indexed and abstracted in Google Scholar. Published article is assigned with a DOI number. ISSN: 2599-0586 (online), 2599-0551 (print). Jurnal Studi Pemerintahan (or known Journal of Government and Politics) ISSN:1907-8374 Online: 2337-8220 is the journal published quarterly a year: February, May, August and November by the Department of Government Affairs and Administration, Faculty of Social and Political Sciences, Universitas Muhammadiyah Yogyakarta, Indonesia collaborate with Asia Pacific Society For Public Affairs (APSPA) http://apspa.org and Asosiasi Dosen Ilmu Pemerintahan Indonesia (ADIPSI) http://www.adipsi.org/ The journal aims to publish research articles within the field of politics and government affairs, and to analys a range of contemporary political and governing processes. The journal's international content offers a genuinely valuable source for scientists and public policy makers in all areas looking for fresh ways of dealing with familiar problems. Distinguished contributors from all over the world present in-depth research and case histories which have tangible practical value and whose methodologies can be applied to solve or mitigate parallel situations. Highly downloaded – Highly cited – International authorship – submissions from 15 different countries. Long history – publishing continuously for 10 years. Jurnal Studi Pemerintahan has been ranked 2 at SINTA and has been accredited by Kemenristekdikti since August 2013 (Decree No.34/E/KPT/2018) and indexed by ASEAN citation index. Published article is assigned with a DOI number. 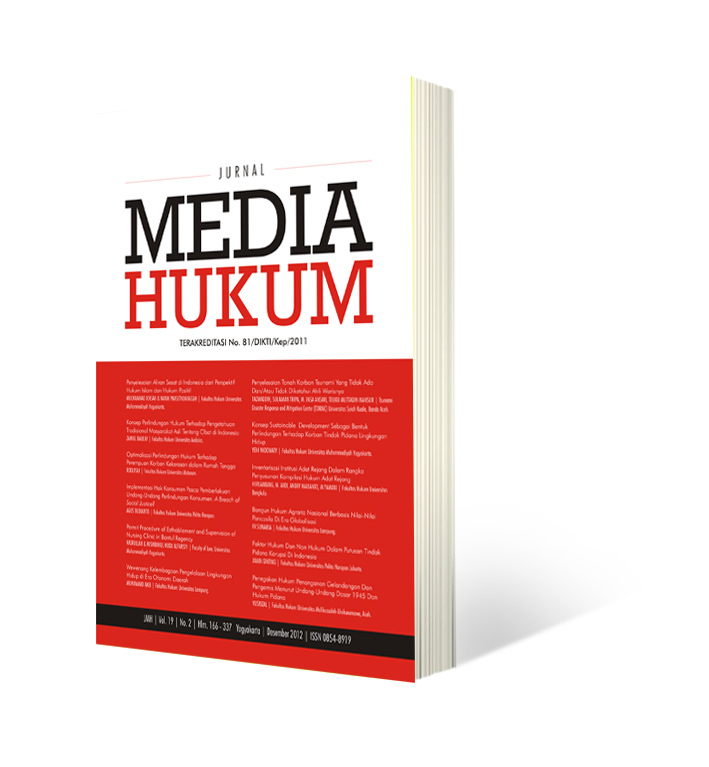 MEDIA HUKUM (JMH) (ISSN:0854-8919, E-ISSN:2503-1023) is journal published by Faculty of Law Universitas Muhammadiyah Yogyakarta. 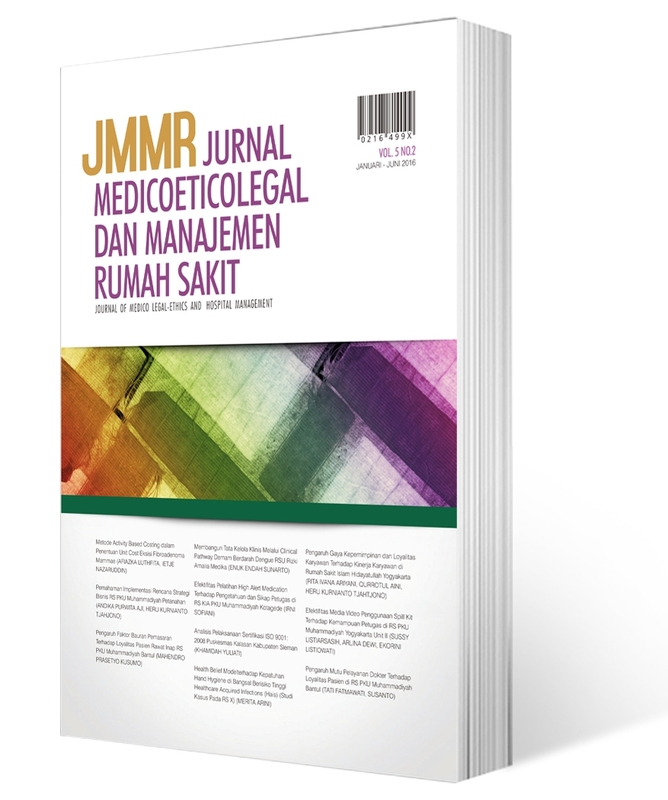 JMH publishes scientific articles that related in law, development and harmonization of Shariah and positive law in Indonesia. JMH are published twice a year, in June and December. Articles are written in English or Bahasa Indonesia and reviewed by competence reviewers. JMH has been accredited by Directorate of Higher Education, Ministry of Education and Culture, Indonesia since 2005: No. 26/DIKTI/Kep/2005, in 2008: No. 43/DIKTI/Kep/2008, in 2011: No. 81/DIKTI/Kep/2011, in 2016: No. 36a/E/KPT/2016. 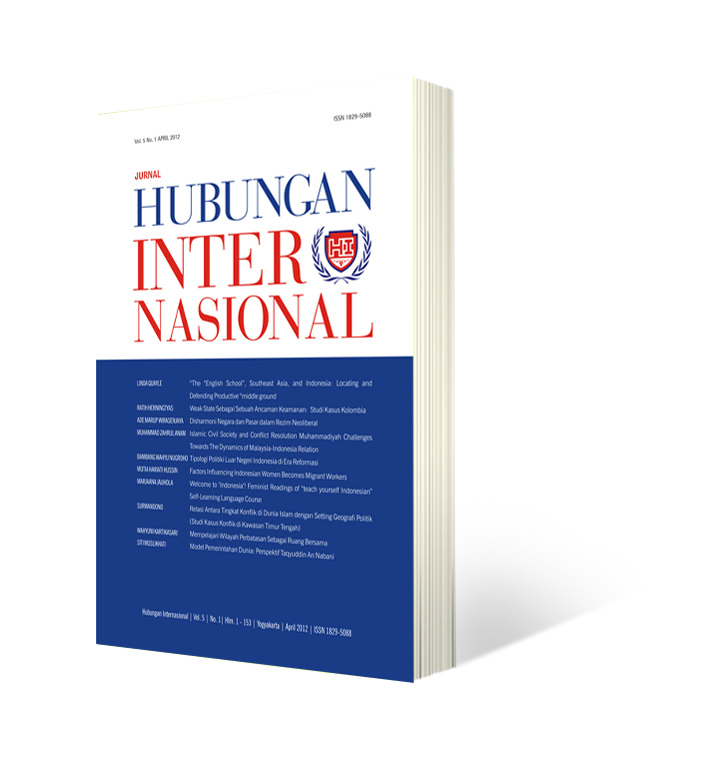 Jurnal Hubungan Internasional (JHI) is a biannual journal published by Department of International Relations, Faculty of Social and Political Science, Universitas Muhammadiyah Yogyakarta, Indonesia collaborates with Asosiasi Ilmu Hubungan Internasional Indonesia(AIHII). JHI publishes articles of research and opinion in the field of International Relations with the topics encompass international political economy, non-traditional issues in International Relations, strategic and security issues, global development, transnational and global civil society, and other issues related to International Relations studies. Any manuscript published by JHI has been through a double-blind review which involved experts and academicians from many universities in Indonesia and abroad. 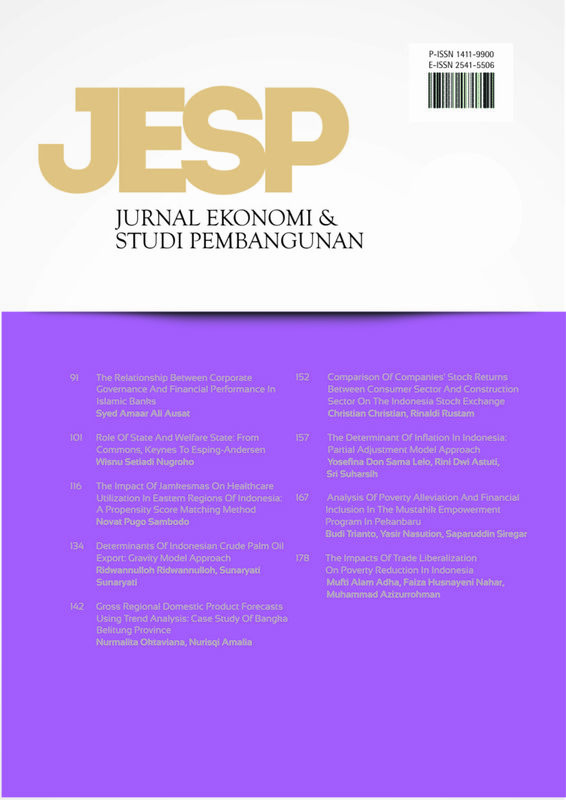 Jurnal Ekonomi & Studi Pembangunan (JESP) is an English peer-reviewed journal published by Universitas Muhammadiyah Yogyakarta in collaboration with the Association of Economics Department of Muhammadiyah Higher Education (APSEP PTM). Since its first issued in January 2000, JESP has been publishing scientific articles consistently, both research and review articles. JESP is accredited grade 2 by Ministry of Research, Technology and Higher Education of Republic of Indonesia, Decree (SK) No. 10/E/KPT/2019. JESP publishes the new editions every April and October. JESP has published both printed (book) and electronic (PDF) versions. 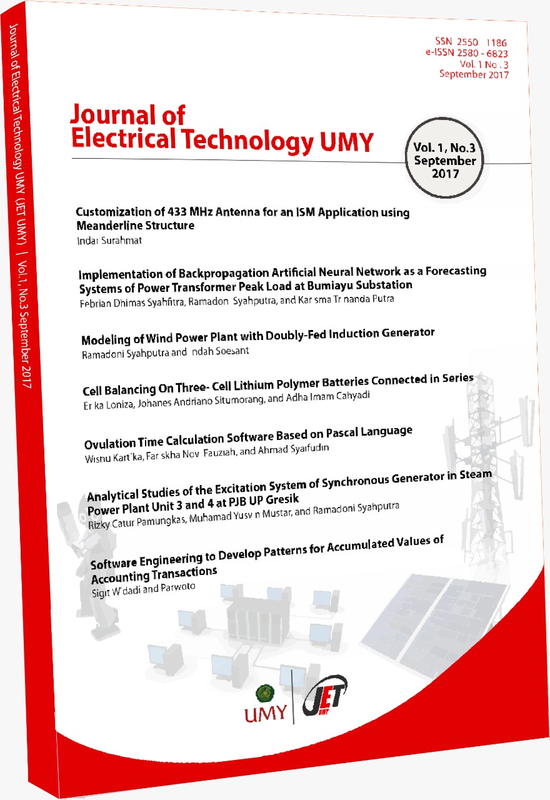 Electronic articles are available on http://journal.umy.ac.id/index.php/esp and printed versions are available for sale (click here to order). JESP is indexed by Google Scholar, Indonesia One Search, Garba Rujukan Digital (Garuda), BASE, and Dimensions. ISSN 2541-5506 (Online) and 1411-9900 (Print). Jurnal Manajemen Bisnis is a bilingual (Bahasa Indonesia and English) peer-reviewed journal published twice a year (in March and September) by Universitas Muhammadiyah Yogyakarta in cooperation with the Association of Management Department of Muhammadiyah Universities (APSMA PTM). Since its first issued in March 2010, Journal of Management Business has been aimed at facilitating a better comprehension of research-based management business sciences among academicians and researchers and thus to give a positive contribution and influence on the world of management business sciences. 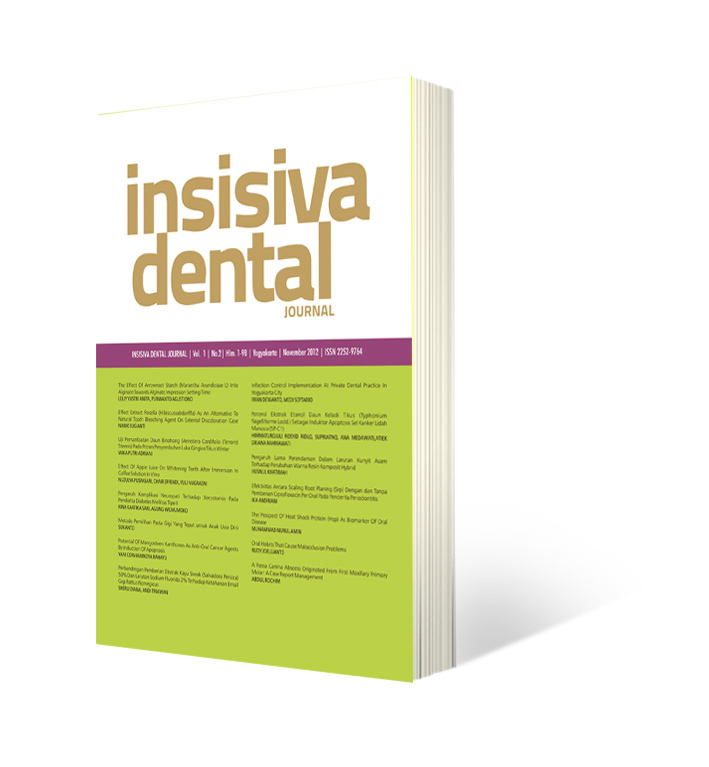 Insisiva Dental Jurnal memberikan informasi tentang ide, opini, perkembangan dan isu-isu di bidang kedokteran gigi meliputi klinis, penelitian, laporan kasus dan literature review. Semua naskah publikasi yang dipublikasikan di Insisiva Dental Jurnal merupakan naskah yang telah direview oleh peer review. IMPORTANT: Before you submit a manuscript, make sure that your paper is prepared using MMJKK TEMPLATE FOR SUBMISSION, has been proofread and polished carefully, and conformed to the MMJKK AUTHOR GUIDELINES. 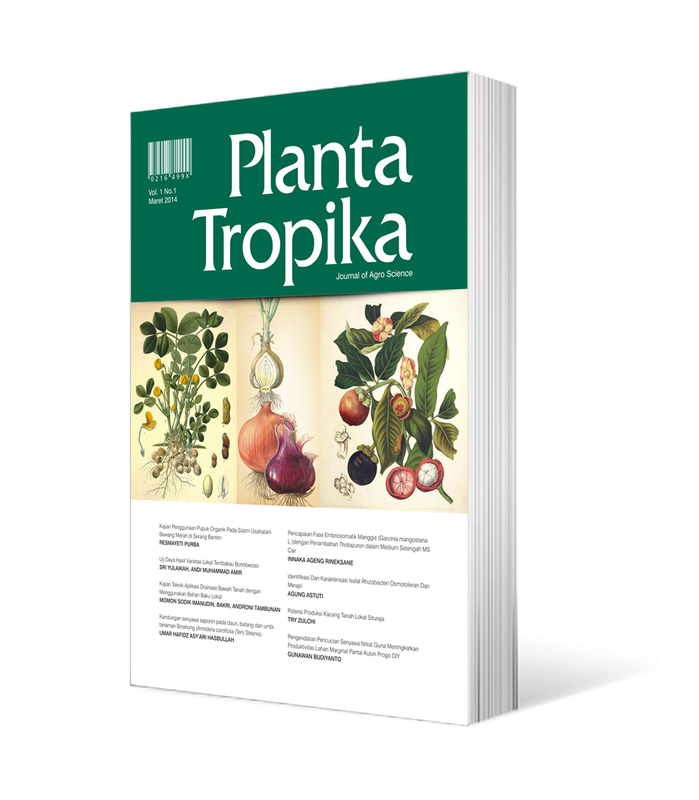 PLANTA TROPIKA : Jurnal Agrosains (Journal of Agro Science) provides a forum for researchers on applied agricultural science to publish the original articles. PLANTA TROPIKA published two times a year (February and August) by Universitas Muhammadiyah Yogyakarta in collaboration with Indonesian Association of Agrotechnology / Agroecotechnology (PAGI). Planta Tropika focuses related to various themes, topics and aspects including (but not limited) to the following topics Agro-Biotechnology, Plant Breeding, Agriculture Waste Management, Plant Protection, Soil Science, Post Harvest Science and Technology, Horticulture. PLANTA TROPIKA is indexed by DOAJ, Google Scholar, and Portal Garuda. Published article is assigned a DOI number by Crossref. AGRARIS is devoted to promote excellent articles on agribusiness, agricultural economics, and rural development that present original findings of contemporary research project. 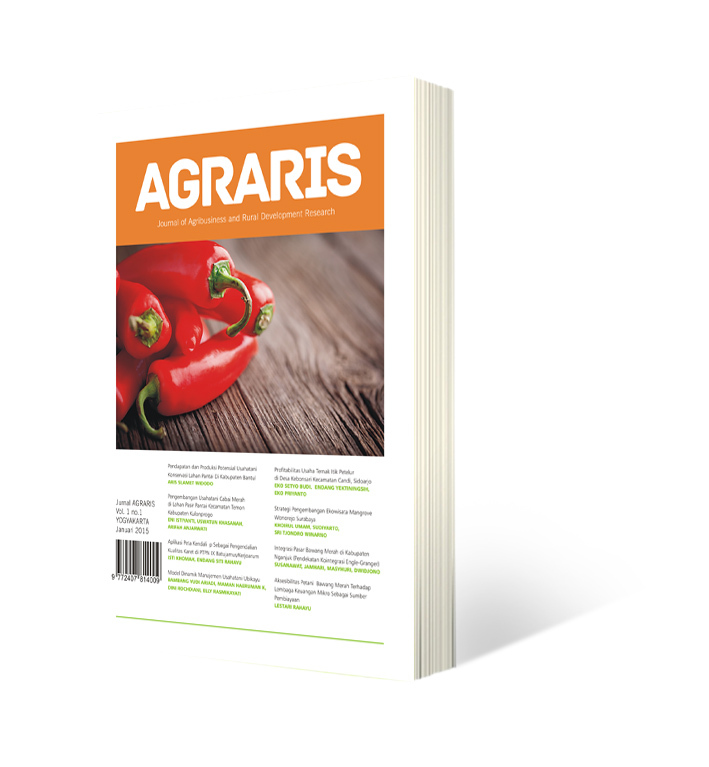 AGRARIS is published twice a year (January-June & July-December) by Universitas Muhammadiyah Yogyakarta, in collaboration with Agribusiness Association of Indonesian (AAI). AGRARIS is indexed by DOAJ, Science and Technology Index (Sinta), Google Scholar, Indonesia Publication Index (Portal Garuda), Neliti and Crossreff (DOI). AGRARIS is a peer reviewed journal that has been accredited by Direktorat Jenderal Penguatan Riset dan Pengembangan, Kementerian Riset Teknologi dan Pendidikan Tinggi, Republic of Indonesia No 51/E/KPT/2017 on 4 December 2017. ISSN: 2407-814X (printed media), 2527-9238 (online media). Jurnal Bisnis: Teori dan Implikasi (JBTI) merupakan jurnal ilmiah berkala (setahun dua kali). Tujuan utama jurnal ini adalah untuk mendiseminasi artikel ilmiah dalam bidang bisnis, yang memiliki fondasi teori dan implemetatif. Berkaitan dengan hal tersebut, artikel yang dipublikasikan harus berkaitan dengan ilmu manajemen bisnis dan akuntansi keuangan terutama yang terkait dengan praktek bisnis. Redaksi menerima artikel-artikel ilmiah yang belum dipublikasikan, baik dalam bahasa Indonesia maupun bahasa Inggris. ISSN: 2085-7721 (Print) dan ISSN: 2622-0733 (Online). IMPORTANT: Before you submit a manuscript, make sure that your paper is prepared using JMMR TEMPLATE FOR SUBMISSION, has been proofread and polished carefully, and conformed to the JMMR AUTHOR GUIDELINES. Jurnal Material DAN Proses Manufaktur focuses on the research and research review in the field of engineering material and manufacturing processes. The journal covers various themes namely Design Engineering, Process Optimization, Process Problem Solving, Manufacturing Methods, Process Automation, Material research and investigation, Advanced Materials, Nanomaterials, Mechanical solid and fluid, Energy Harvesting and Renewable Energy. 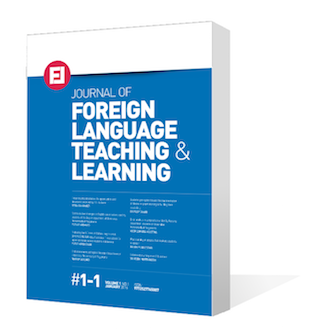 Journal of Foreign Language Teaching and Learning is published by English Language Education Department, Faculty of Language Education, Universitas Muhammadiyah Yogyakarta. In Association with APSPBI, articles that have not been published are invited. The Editor in Chief, Associate Editors and Reviewers will review the articles and they can make changes the format without changing the contents of articles. Power devices, energy conversion, mathematical modelling, electrical machines, instrumentations and measurements, power electronics and its applications (power electronics applications for home, aerospace, automotive, lighting systems and so on), telecommunication system, signal processing, control system, electronics system, computer system, diagnostics, reliability, dependability safety and electromagnetic compatibility, power generation, transmission, and distribution, power system planning and control, network harmonics, power quality, optimization techniques, fault location and analysis, distributed generation, co-generation, renewable energy sources, energy management systems, applications of expert systems, electric and hybrid vehicles, vehicular technology, magnetic fields, theory and modelling of magnetic materials, nanotechnology, plasma engineering, sensors and actuators, electrical circuits, teaching and continuous education, and another related topics. published threemonthly, appearing on the last day of March, June, September, December. 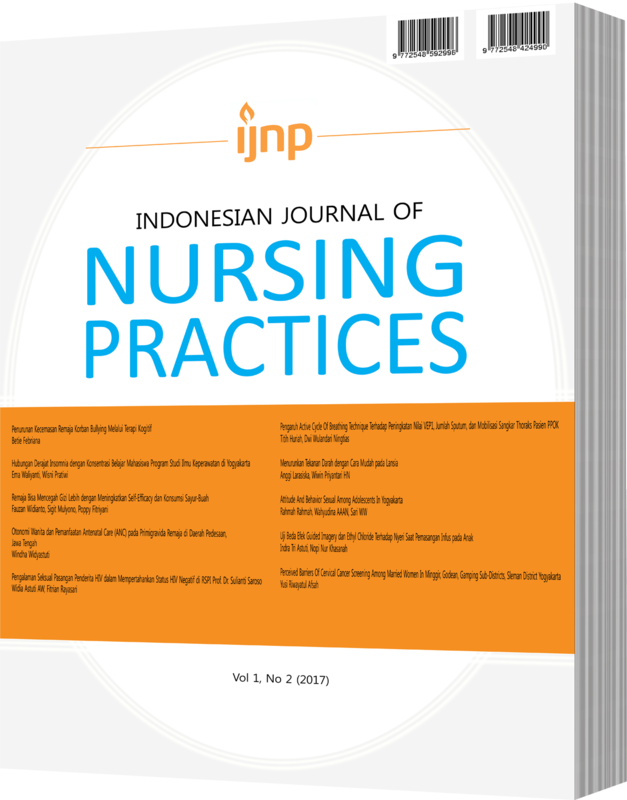 Articles published in JLEL can be written in Bahasa Indonesia and English. JJLEL is a forum for publishing original research articles, paper-based articles and Linguistic reviews that have never been published before. All texts are reviewed by at least one competent riveiwer in the related field. JJEL is a peer-reviewed academic journal published by the Japanese Language Education Program Faculty of Language Education Muhammadiyah University of Yogyakarta. JJLEL is an open access journal, which means that all content is freely available at no cost with the use of his / her agency. Users are allowed to read, download, copy, distribute, print, search or link to the full text of the article, or use it for other legitimate purposes, without requesting prior authorization from the publisher or author. Medika Teknika : Jurnal Teknik Elektro merupakan jurnal yang mewadahi paper dan naskah dari bidang ilmu teknik elektro, teknik tenaga listrik, teknik kendali, teknik telekomunikasi, teknik elektronika, teknik elektromedik, dan biomedical engineering, life support dan diagnostik. 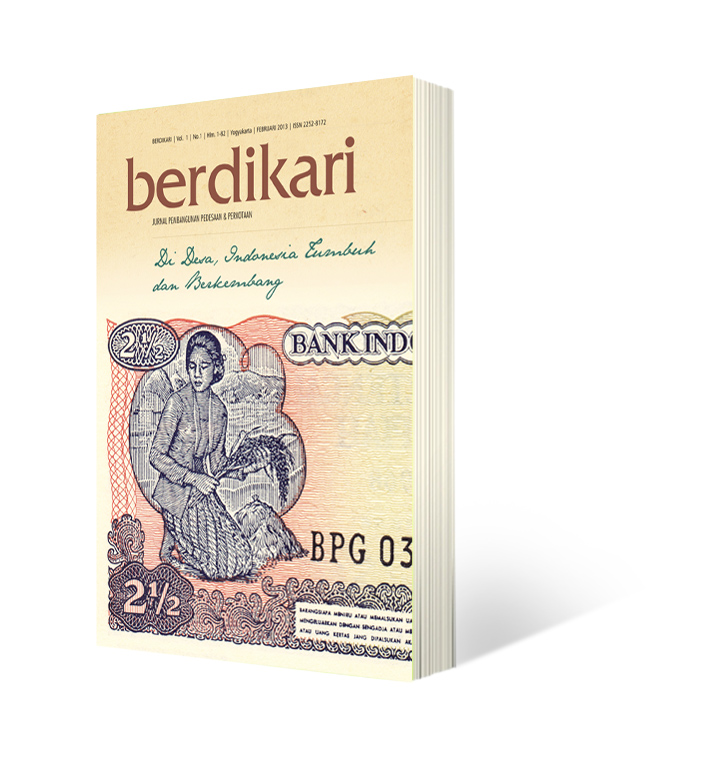 Jurnal ini terbit 2 kali dalam setahun yaitu pada bulan April dan Oktober. Jurnal ini lebih membahas kepada masalah pada bidang teknik terutama bidang ilmu teknik elektro. 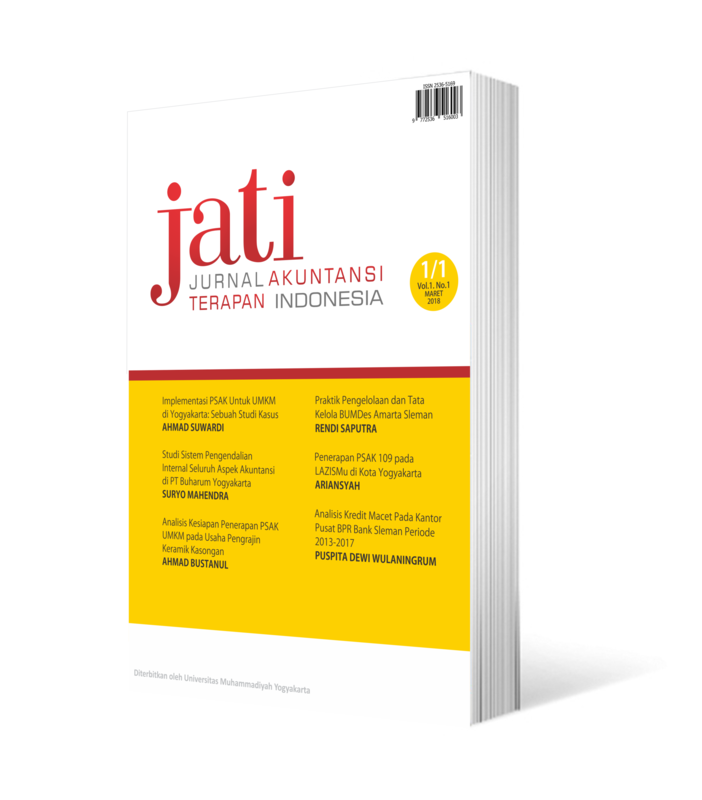 Jati: Jurnal Akuntansi Terapan Indonesia or (JATI) is peer-reviewed journal published by Universitas Muhammadiyah Yogyakarta in collaboration with the Association of Accounting Department of Muhammadiyah Higher Education (APSA PTM). ISSN: 2615-157X (Print) and 2615-0689 (Online). JATI publishes articles that specifically related to case study in Accounting. JATI publishes article twice a year, in March and October. Articles submitted to JATI are going to be reviewed by competence editor and reviewer. Bulletin of Civil Engineering (BCE) is an international journal of civi engineering. 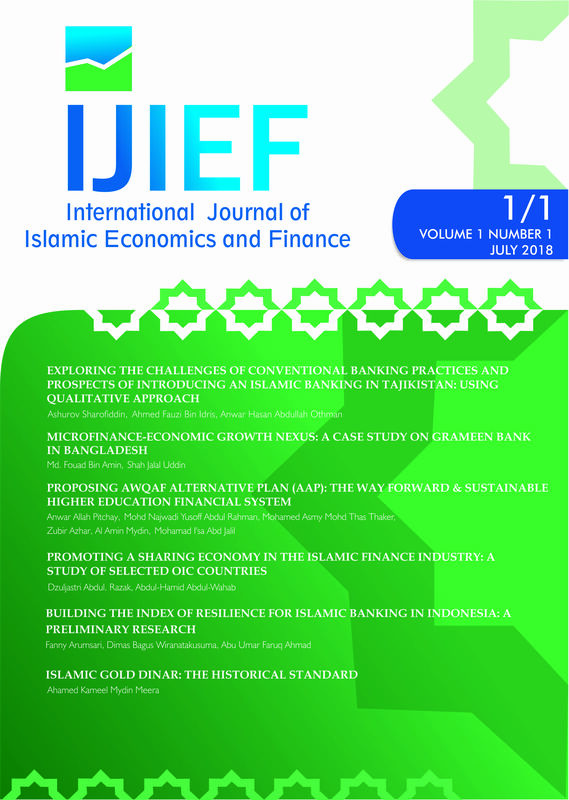 International Journal of Islamic Islamic Economics and Finance (IJIEF) is a journal which is bianually issued (January and July) and initiated by International Program for Islamic Economics and Finance (IPIEF). 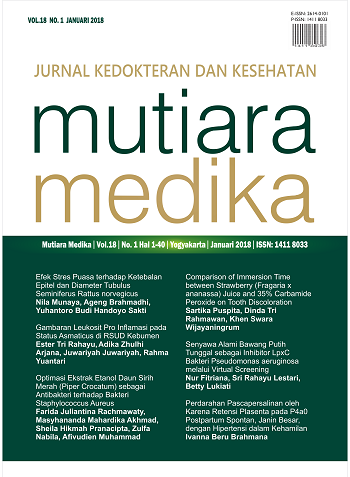 The publisher of this journal is Universitas Muhammadiyah Yogyakarta. The publication of this journal though tighly-peer reviewed process using Open Journal System (OJS). For the publication, IJIEF only accept research article and publish it in electronic (PDF) version. The electronic publication can be accessed openly on the website http://journal.umy.ac.id/index.php/ijief/index. IJIEF commit to embrace the best research article in islamic economics and finance fields from the whole world and publish it consistently. Emerging Information Science and Technology is a peer-reviewed journal which publishes novel, innovative, and state-of-the-art research articles in the area of information science and technology. The articles in this journal cover from theoretical, technical, empirical, and practical research. It is also an interdisciplinary journal that interested in both works from the boundaries of subdisciplines in Information Science and Technology and from the boundaries between Information Science and Technology with other disciplines. The journal is published twice in a year. Indonesian Comparative Law Review (ICLR) (ISSN: 2655-2353, E-ISSN:2655-6545) is a periodical scientific-journal published by the Faculty of Law, Universitas Muhammadiyah Yogyakarta in collaboration with the Indonesian Association of Comparative Laws. The journal will be published twice a year in December and June. ICLR’s vision is to be a leading scientific journal in comparative law. ICLR has a unique approach in creating innovative discourse on harmonization among legal systems. ICLR will receive many articles from legal scholars from reputable universities worldwide.